Chef Johnny Gnall has been experimenting with pearl couscous sent from Bob’s Red Mill, with delicious results. His report follows. If you have questions or suggestions for tips, email Chef Johnny. When most people think of couscous (KOOS-koos), they think of Moroccan couscous: fluffy piles of semolina, their tiny grains not much larger than coarse cornmeal. But pearl couscous (also called Israeli couscous) has been making its way onto more and more menus and supermarket shelves. The beautiful round beads (pearls) of semolina are most deserving of finding their way to your kitchen. The pearls have a pleasant, chewy texture when properly cooked, giving the couscous a real comfort food quality. Think of macaroni and cheese made with big, thick elbow noodles. That same type of enjoyable, al dente bite is so satisfying, and it’s something that you can’t get out of Moroccan couscous (though you’re probably not looking for it there anyway). People often think of pearl couscous as exotic. But it’s made of the same semolina wheat as pasta. You should think of it as any other small cut of pasta, like alphabets; corallini, ditallini and tubettini (tiny tubes); orzo (shaped like grains of rice); and pastina (tiny stars). Bob’s Red Mill carries three varieties of pearl couscous: Natural, Tricolor and Whole Wheat. Original couscous is beautiful: The small ecru-white beads are elegant whether in a soup, underneath a protein (see salmon photo below) or in a salad or side dish. Tricolor couscous is fun, visually appealing pearls of white, green and pink (the latter two flavored with spinach and tomato, respectively). It’s especially appealing in a salad, side or dessert (such as a couscous riff on rice pudding). Whole wheat couscous provides a particularly nutritious alternative to rice or pasta (or other couscous). Bob’s Red Mill Whole Wheat Pearl Couscous is like other whole wheat pasta that is made with 100% whole grain flour. It contains 7 grams of protein and 25 g fiber per 1/3-cup serving. Pearl couscous substitutes seamlessly for rice or any grain. Cook pearl couscous like pasta: Bring salted water to a boil, using 1.5 times the amount of water as pasta (or cover the dry pasta by 2-3 inches). You can also use stock, or toss a bouillon cube into the water for extra flavor. Add diced tomato, red onion, feta cheese and torn basil for a Greek-style salad; use cherry tomatoes, sundried tomatoes or roasted red pepper when tomatoes are out of season. Or use chopped pistachios, golden raisins and cubed roasted squash for a Moroccan-style salad in any season. In fact, you can add just about any three ingredients to make a couscous salad. Try a vegetable, a nut or legume and an herb, tossed with olive oil, salt and pepper to taste, and a splash of acid—citrus juice or vinegar. Proteins are also welcome: cubes of chicken and tofu work especially well. The recipe in the photo at the top uses leftover corn and peas, a bit of oil and balsamic vinegar, and a garnish of grated Parmesan. For the best presentation, cut or chop your ingredients into small pieces, so they look at home nestled within the pearl couscous. Top couscous with tomato sauce and shredded Parmesan to keep it simple. 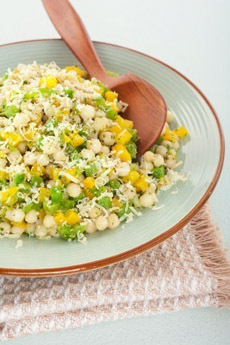 Or toss it with olive oil, herbs and vegetables for Pearl Couscous Primavera. If you want to indulge, make some Pearl Couscous Carbonara with egg, Parmesan and diced pancetta. 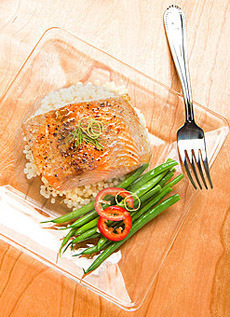 Salmon atop a bed of couscous. Photo by M. Sheldrake | Dreamstime. Three words: Mac. And. Cheese. The chewiness of pearl couscous really is wonderful with a gooey cheese like Gruyère or mozzarella, and a topping of crispy breadcrumbs (try panko). The symphony of tastes and textures will have your lids dropping in pleasure. Start by toasting the pearl couscous in a pot over medium-high heat with a touch of olive oil. Then begin stirring liquid in, just as you would with risotto. You can use any liquid that suits you; water or stock with a little white wine are probably your best bets. Once it’s cooked, drop pearl couscous directly into soups, stews and chilis. It provides a pleasant texture and adds body to the food. To add some extra love, flavor the couscous cooking water with some of the vegetables or aromatics in the main dish. Just drop them into the pot with the couscous as it cooks. Carrots and onions impart a bit of sweetness, herbs add depth and flavor. Even a bone from whatever beast you may be stewing can be a nice touch to build the complexity of your couscous. Couscous is more than 1,000 years old. The Berbers, who lived along the northern (Mediterranean) coast of Africa, west of the Nile Valley (modern Algeria, Morocco and Tunisia—the Barbary Coast/Berber Coast), ate wheat as a staple grain. Over generations, they learned that by grinding the wheat and making couscous, it would keep for years—insurance against drought and famine. The result has long been a base for North African cooking. Couscous is made from yellow granules of semolina, made from durum pasta wheat, which are precooked and then dried. The pearl grains are the original couscous. They were made by hand-rolling semolina grains on screens, with olive oil, water and salt, letting the small grains fall through, and rolling them again until a consistent size grain was formed. The grains are then coated with olive oil salt and sun-dried, giving them a toasty flavor when cooked. The name is derived from Bhe Berber seksu meaning well rolled, well formed and rounded. The term can refer to the ingredient itself or a prepared dish. Like pasta or rice, couscous is versatile and has numerous preparations. It is simple to prepare: Just add boiling water and let it sit. It can be flavored with exotic spices or served plain. North African stews (tagines) are traditionally served over it. Couscous is now widely available in most supermarkets. Keeping with food trends, specialty producers such as Bob’s Red Mill sell whole wheat couscous and tricolor in addition to the natural white pearls.